Die Shop Equipment – Manual Equipment – AmeriKen Online! Ameriken carries the complete line of Helmold diemaking equipment. We also stock accessories and dies for all Helmold equipment. Whether you’re just starting a die shop or looking to upgrade, AmeriKen can help you determine what equipment will best suit your needs. Call us today. Increase productivity with Helmold’s Power Assisted Notcher, Bender and Rule Cutter. The Ruling Station Starter Kit contains four pieces of Helmold equipment that every new die shop should have. These affordable diemaking tools are versatile, easy to use, and will provide years of reliable service. The Standard Bender is a universal die room bender for 2 and 3 pt rule. It uses interchangeable male and female dies to form rule into the desired shapes without disturbing bends previously made. It’s equipped with an adjustable stop that can be set in an instant, limiting movement of the dies and enabling the user to readily make duplicate symmetrical bends. An adjustable gauge is included and can be used on either side of the bender for locating the position of rule relative to the dies. An excellent starter tool for making simple bends and a great second machine for simple set bending operations. The Standard Bender is designed for use with rule up to 1″ in height. The Helmold Bender Bendall is a versatile 2 to 3 pt rule bender. It has an extended back block which allows either standard dies or bending mandrels to be used and permits closer bends and circular shapes to be produced, beyond the capabilities of the Standard Bender. An optional 9-size Mandrel and Sleeve set combined with the standard accessories (see below), makes a complete set of mandrels from 3/16″ to 1″. The Bender Bendall is designed for use with rule up to 1″ in height. Standard accessories are available, including Mandrel Diameter (bushings, support links, adapter and die holder included). The Modified Bender Bendall has two design modifications as standard. 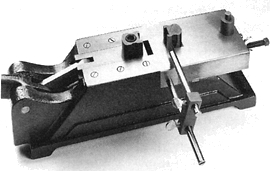 Vise-action holders allow tightening of loose-fitting dies for precise alignment of new or worn bending dies. An Allen wrench is used to close the jaws. A locking dovetail back post is designed to deliver consistent bending even after years of use. The Heavy Duty Bender is a good choice for diemakers who are bending 3 and 4 pt rule. Like the Standard Bender, it has an adjustable stop that can be set in an instant, limiting movement of the dies and enabling the user to readily make duplicate symmetrical bends. An adjustable side gauge, identical to the one found on the Standard Bender, can be used on either side of the bender for locating the position of rule relative to the dies. The bender has a standard 1-1/4″ high post and optional mandrel sets designed for thicker rule. The front die holder is recessed, keyed and bolted to eliminate springing and turning, and the rear die holder slides out to accommodate any required mandrel. Optional 1-1/2″ and 2″ high posts are available. In order to use mandrels with this machine, a mandrel adapter and dovetail extension are needed. if the mandrels are under 5/8″ diameter, a rear support post and link will be required. The Heavy Duty Bender is designed for use iwth rule u to 2″ in height. consistent bending even after years of use. The E-Z Bender Bendall has the same specification of the Bender Bendall with three exceptions. It has a patent-pending toggle-joint mechanism in the handle that enables it to deliver the same results as your traditional tools, but demand only one-fourth the effort. The E-Z handles also have ergonomic, variable hand positioning that accommodates any working height and angle you personally find comfortable and convenient. 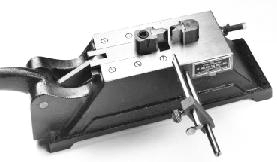 Also standard on the E-Z line are the vise-action die holders and locking dovetail back post modifications offered as a Modified Bender Bendall. 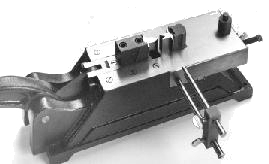 The die holders allow tightening of loose-fitting dies for precise alignment of new or worn bending dies, only an Allen Wrench is needed to close the jaws. The locking dovetail back post is designed to deliver consistent bending even after years of use. Like the E-Z Bender Bendall mentioned above, the E-Z Heavy Duty Bender has the same specifications of the Heavy Duty Bender with three exceptions. It has the patent-pending toggle-joint meachanism in the hand so it deliverys the same results as traditional tools with only one-fourth the elbow grease. Also standard on the E-Z Heavy Duty Bender are the vise-action die holders and locking dovetail back post previously only offered on the Modified Benders.